I offer a special self-guided activity to experience restaurant/bar hopping in gourmet city Osaka. It is available throughout the year. Osaka locals enjoy it too, but it's perfect for domestic/international visitors wishing to explore the culinary side of Osaka. Purchase the ticket first. 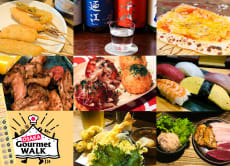 Participating locations ranging from Osaka's famous treats (Takoyaki, Okonomiyaki, Kushikatsu, Beef innards), Sushi, Tempura, Gyoza, Yakitori, Sashimi, to desserts like pancakes ＆ crepes. From popular shops on main street to secret shops in the back alley or inside of multi-tenant building which not even locals are familiar with. Present your ticket at each location ＆ order a special menu.